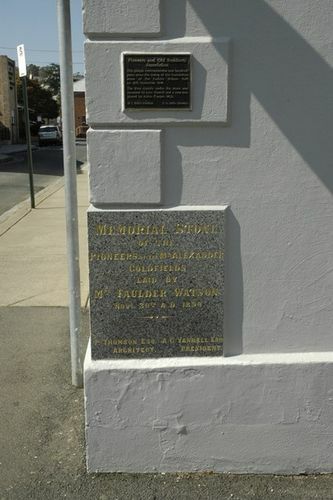 The Memorial Stone of the Faulder Watson Hall commemorates the pioneers of the Mount Alexander gold fields. In the cavity of the stone was placed a bottle containing journals of the Pioneers Association, copies of the local newspapers, coins of the realm, and a silver medal of the Association. The Faulder Watson Hall was erected by the Pioneers and Old Residents Association and opened in 1895. Mrs Faulder Watson provided a gift of £1250 while the association bore the balance of the cost. The hall was named after her husband. A. C. Yandell Esq. President.